Click the above for a 360-degree view of Sandmeyer in operation—may not be compatible with some browsers. For the ultimate 360-degree interactive experience, view the videos with the YouTube app on your tablet or smartphone. Move your mobile device for a 360-degree view. 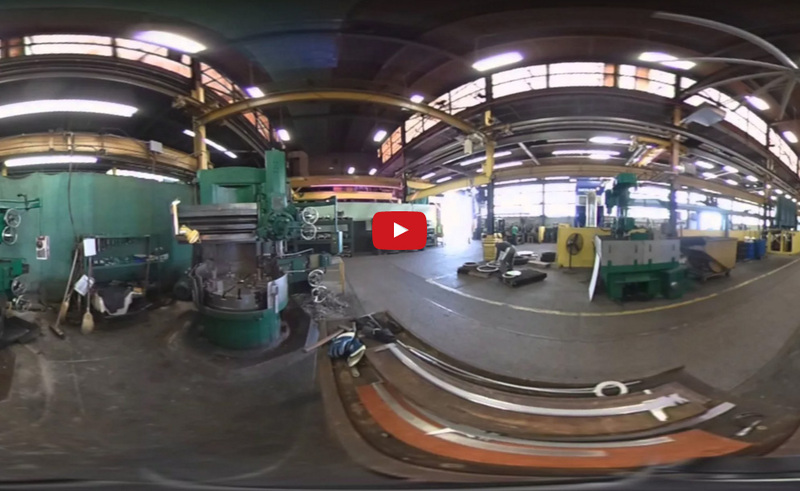 Medical Video Production worked with Sandmeyer Steel in 2016 to create four 360-degree interactive videos to be featured on their newly-redesigned website. Some of their stainless steel plate products are often used in medical applications. Sandmeyer wanted to focus on some of the many steel processing machines that they use throughout their vast facility. A 360-degree camera was used to capture footage of not only the machines themselves, but also the fast-paced production processes. This advanced video technology gives viewers a different viewpoint into Sandmeyer’s world, all while being interactive. Viewers can move their smartphone or tablet to feel as if they are looking around the facility on-location. This perspective can also be viewed on desktops, as the viewer can scroll throughout the video using their mouse. Technology like 360-degree interactive videos puts the control into the viewer’s hands.